Clicker training has taking me many different training directions. 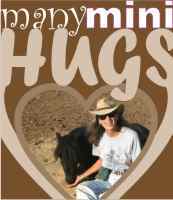 With the minis I've been able to explore the world of therapy animals and helping people. There are several pages on this site that show some of the things we accomplished in our training, done with positive reinforcement, food rewards and a marker signal (the click). Thank you for visiting this part of the site. I hope you find training ideas and inspiration. I can say one thing for certain, owning miniature horses has totally changed my horse experience. Really, I had no idea they could be so much fun. There are so many things you CAN'T do with a miniature horse (like riding) that people tend to write them off or think of them as glorified lawn mowers. As a clicker trainer I have found that "limitation" to be totally enlighening, educational and it has downright changed how I train and handle ALL horses. One of the directions my mini training led me was in the field of therapeutic interatctions between horse and human. I have found the minis who are clicker trained tend to be somewhat eerie and uncanny in their ability to relate to people in a kind and gentle way. They are especially gentle with those who might have some physical or mental disability. I'm excited to be entering this additional phase in my horse training/teaching career and hope you join me while I journal and blog the progress. I had the opportunity to take Handsome to a birthday/retirement party. There we met many wondeful people of all different ages, gathered to celebrate a most unusually giving, talented and generous woman. 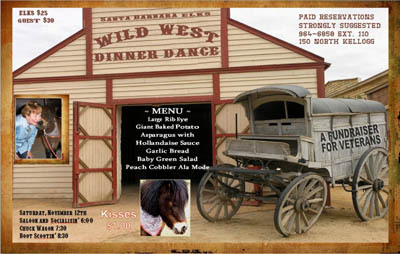 At this event I took Handsome to act as equine embassador to all the party goers. As usual, Handsome did his assorted bell ringing tricks, waving hi, lying down on cue and giving kisses to all. The thing that made this particular afternoon unique was the interaction between Handsome and one boy who looked like he had some level of autism. As I watched this boy interact with Handsome I began to think I'd better intervene on behalf of the horse, who was receiving a bit of rougher handling than I thought he was used to. Then the amazing happened. I began to see Handsome artfully negotiate this little boy by moving "just" out of reach when he was being patted too hard, but then moving back into range when the petting became softer and more to his liking. Handsome wasn't being "held tight" with the halter; he had total freedom to back away from the interaction. The wonderful part is, Handsome didn't back away to another part of the pen, in fact he gently "taught" this young lad how to be around a horse. He taught the boy how to bridge the non-verbal communcation gap that often occurs between species. It was pure, simple and truly beautiful to watch. McKee is a little horse with a LOT to give. He is also a smart horse, in fact he is a very smart horse. He's even learning how to do some scent detection (you know, like the dogs who sniff out drugs). Only McKee isn't sniffing any drugs, he's learning to find a mat that smells like lavender oil. But McKee is learning more about entertaining people, finding out how to get his head scratched or petted and how to see if he can get a bite of carrot for waving "hi." McKee, Handsome and I are very proud to be invited back to the Elks Lodge in Goleta to support another fundraiser for the Veterans. We will be a part of a huge gathering of supporting people complete with a B-B-Q, band, dancing and all around good time. The boys will be offering "kisses" for a donation to the cause. The event is schedule for Nov. 13th, 2011. Oh, and the food and music are FANTASTIC! Handsome has begun his 5th year as a bell ringer for the Salvation Army. Our first day was filled with smiles, pictures and of course, a few kisses from Handsome. The local Kiwanas club was so gracious as they let us share their ringing time allowing Handsome to focus on the people who came to visit. Be sure to give a hearty thanks to the Carpinteria Kiwanas. We plan to ring other times this year so check back for Handsome's schedule. McKee has started sharing his enthusiam for painting with friends and family. He has a new video that shows him in action. For those of you who are following McKee and his painting progress, it's fun to note that he is continuing to expand and broaden his brush strokes. He is very fun to watch and I hope you enjoy his latest video. You can see him in his TV debut with KEYT news or see his Video Interview with the Santa Barbara NEWSPRESS. We're going on the Road!!!! 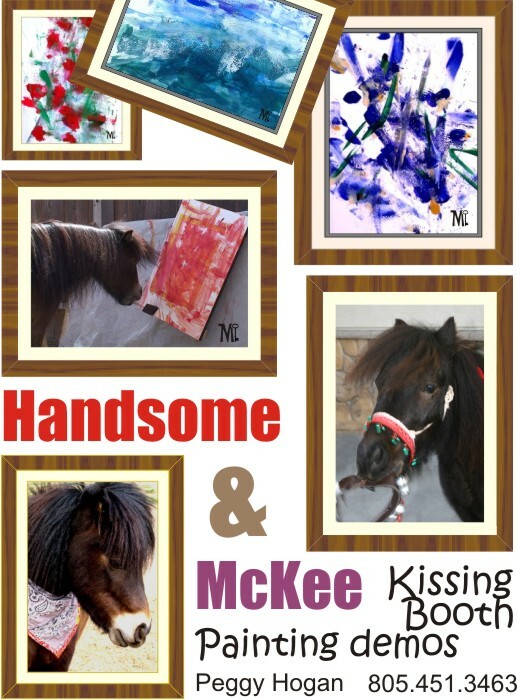 We'd love to have you come join Handsome and McKee for a wonderful fundraiser event called "There's No Place Like Hope." be doing a Painting Demo. His paintings will also be on sale at this event. For a look at some of McKee's paintings you can click here. 13165 Santa Rosa Road, Santa Rosa Valley (Camarillo) California, 93012!! Many Mini outings - pictures and stories for your enjoyment. About Us | Site Map | Contact Us | ©2007 The best whisper is a click .